Petrosys users can automatically calculate fault polygons from fault sticks and horizon data – this is a major time saving over manual workflows. The output polygons can identify problems with the source interpretation and are an excellent QC tool for the fault sticks themselves. The output polygons can be edited if required in the Spatial Editor. Fault sticks are supported from Petrel, DecisionSpace, Paradigm and DUG Insight. When using fault sticks in gridding, fault polygons are calculated using the estimated horizon/fault stick contacts. These fault polygons are embedded within the output grid file and may optionally be saved to a separate fault file. The fault polygons may also be smoothed spatially if requested by the user and their Z-values are populated so that they tie to the output grid surface. One of the major advantages of the Petrosys algorithm is that there is no pre-requisite surface framework modeling required to run this option, other than to make sure the fault sticks are all assigned to their corresponding fault surface. This means the workflow for generating fault polygons from interpretation data becomes much simpler than in other packages. To illustrate the work flow we will use a Petrel interpretation project with a 3D survey. 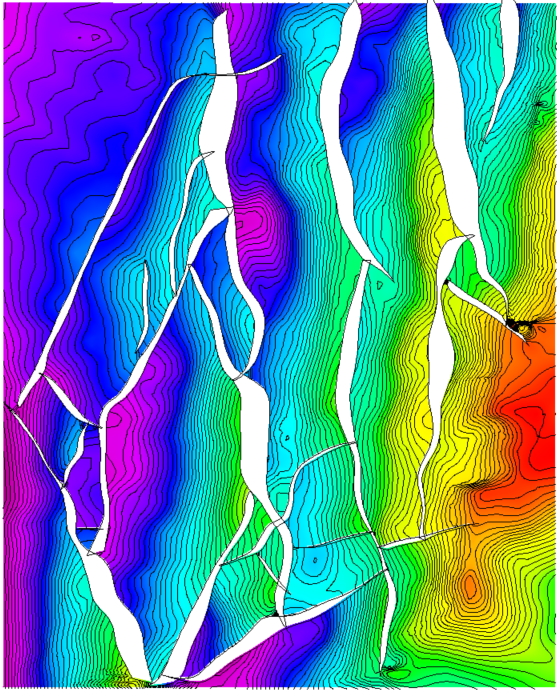 An interpreted horizon is selected having gaps across interpreted fault segments. The fault sticks/segments have been grouped by fault plane designation. 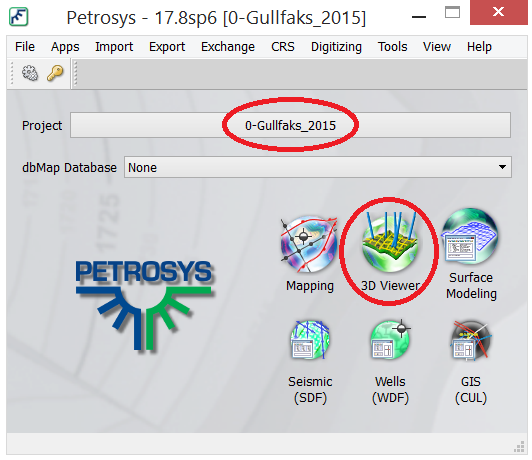 The Petrosys Plug-in tools are accessed directly from the Petrel launcher. After Petrel was opened and a project was selected, the Petrosys Application Launcher opens. An equivalent Petrosys project is chosen or created, if it doesn’t already exist. 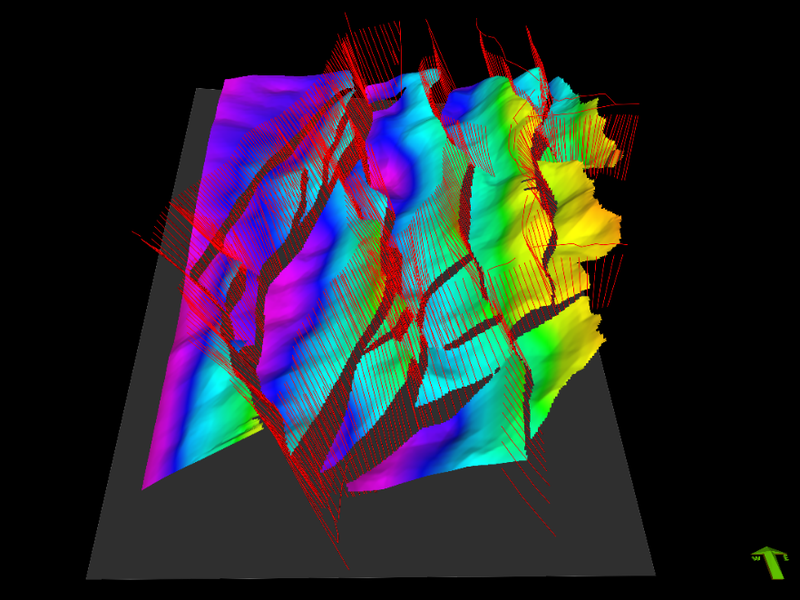 Petrosys 3D Viewer directly displays Petrel horizon and interpreted fault sticks to be used in the gridding workflow. In the Input tab, choose the Input Data button and select the horizon interpretation to be gridded with the fault sticks. The interpreted horizon should intersect the fault sticks being chosen and have a gap in the interpretation across the fault. 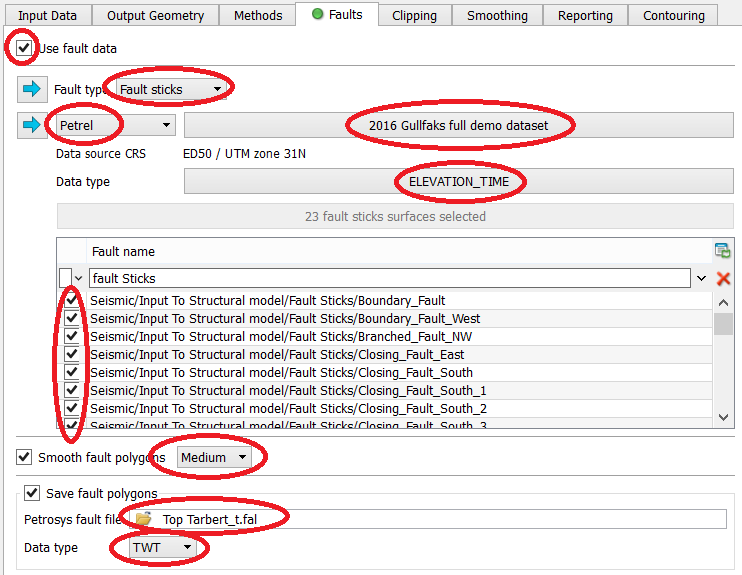 In the Output Geometry tab, select 3D seismic survey and choose the Data Source 3D survey to control the AOI of the output grid. The Methods tab can be kept as the default (Standard Gridding / Minimum Curvature). In the Faults tab, Fault Type is set to Fault sticks. Select the 3rd party application source, project, data type and the fault sticks to be used for the gridding. Smoothing can be applied to the output polygons – select Medium for the first iteration, to smooth out jagged areas of the output polygons. The generated polygons can be saved to a Petrosys polygon file along with a Data type designation for the z-values extracted during the gridding process and saved within the polygon file. Petrosys’ Create Grid tool showing the Faults tab setup, as an example, when choosing Fault Sticks from a Petrel project as part of the gridding process. Petrosys grid displayed in Mapping tool with the embedded fault polygons generated by using the intersecting fault sticks! Petrosys Editor with a grid selected having embedded fault polygons. The display shows a fault polygon selected for editing. 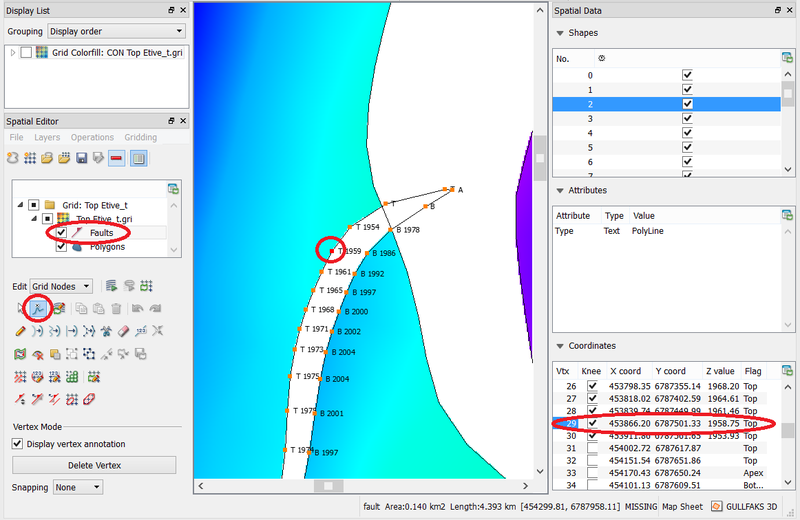 The Vertex tool has been chosen to show the point locations, the flag for Top, Bottom or Apex point type and the z-values extracted for these points during the gridding process. These data can be edited manually using the table display on the (default) right side of the window. The Editor’s line editing tools can also be used to modify the polygon outlines. All edits can be saved back to a fault polygon file and incorporated in the grid. Contact support@petrosys.com.au if you need assistance in setting up gridding operations that use Fault Sticks from a 3rd party source.